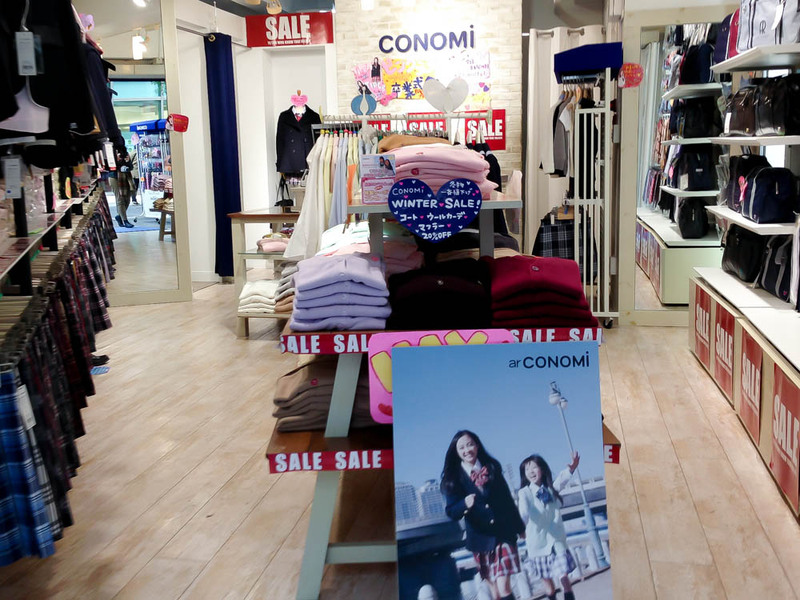 If you're into school girl style—or Kogal as the Japanese say—you'll want to head to Conomi in Harajuku for the head to toe look. This place specializes in "seifuku", which means school uniform in Japanese, and that's exactly what you'll find here. Knee socks, tartan skirts, cardigans, tipped blazers, ribbon ties, and of course the perfect old school, Japanese high school uniform sailor top, can all be found at this boutique. There's also a section for men, although much of the main focus is on the junior ladies wear. The store doesn't actually outfit any private school students that require uniforms, but the Japanese school girl (or boy) look is so highly sought after that kids that aren't required to wear uniforms do so around Tokyo. The look is thought to be kawaii or cute, and considered to be a privilege of youth—so much that people in their 20s and 30s can often be seen still wearing high school uniforms. It's also not unheard of to see groups of girls dressed in their prep school best shopping in Harajuku on the weekends. Even though Conomi was only founded in 2009, the Japanese obsession with Western school girl outfits started in 1921 when they were first introduced by an American missionary, Elizabeth Lee. She was running an all girls school and thought they would enjoy the freedom of movement that British navel uniforms would provide—something she would regularly wear herself. Today the look has spiral into it's own culture, with magazines, bands, and even comic books. Conomi is a big part of that, supplying the subculture with high quality sailor and school uniform looks for the fashion conscious, who want that school girl look. The house label ar-CONOMi is the most sought after brand in the store, but they also carry pieces from Olive des Olive, Kuri-Ori, Beverly Hills Polo Club, and Hiromichi Nakano. Like the style, but not young enough at heart to pull off this look? The accessories are the most popular items—think bows, pins, and ties. A little goes a long way! Conomi is actually so popular that the brand puts on regular fashion shows to highlight the season's best and brightest in uniform apparel, and holds an annual show in Paris.